WELCOME TO THE WEBSITE OF THE RECORDERS OF UTTLESFORD HISTORY ! New material is constantly being added to the individual village pages of this website - click on icon top left for additions. The Recorders now have a Facebook page which is open to all those with an interest in the history of this beautiful district. New publication: Chepyng Walden - A Late Medieval Small Town: Saffron Walden 1438 - 1490, by Elizabeth Allen. On sale from the TIC. Click here for details. New book. 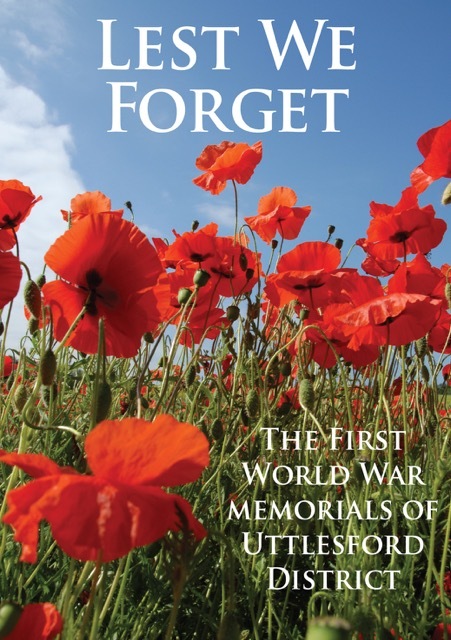 The Recorders of Uttlesford History are pleased to announce the publication of their new book LEST WE FORGET' - The World War One Memorials of Uttlesford District. Priced at £8, it has over 200 colour illustrations and is on sale at the Tourist Information Office in Saffron Walden or by email enquiry to fiona.bengtsen@btinternet.com. Click here for details. New book, Radwinter in the First World War, is now available. Click here. We are again privileged to put online some of Mia Polley's beautiful woodcuts of scenes through the seasons in Margaret Roding. Click here. New publication - Sir Thomas Smith of Saffron Walden. Click here for more details. New book - Circular Walks Along The Uttlesford Way. Click here for more information. New book - The Placenames of Saffron Walden. Click here for more information. A gazetteer of handpumps and wells in Uttlesford is now available. Click here for to see more. CAKE Book launched by Mayor, Bob Eastham. This beautifully presented book is dedicated to the men and women from the villages and towns of Uttlesford who served in the First World War. The objective was to record the many memorials erected in memory of the fallen together with the many individual gravestones in the churchyards. Additional information was gathered on the individuals and where possible stories about the impact of the conflict on the civilian population are included. Gathering the information for nearly 60 locations and distilling it into a coherent format with a large number of colour illustrations was a formidable challenge. The editorial team have done a magnificent job in presenting the findings organised on a settlement basis. The quality of production is consistently high with an outstanding cover picture which commands attention. This volume is unique in terms of its coverage of a large region. The overview is that around one thousand of the fallen came from Uttlesford, an awful measure of the scale of casualties. The impact on communities can barely be imagined. This book makes no claim to be definitive due to the number of omissions, deliberate or otherwise, and duplication of names etc. on memorials. However, its scope is such that many local historians and families will make it a permanent reference work. This book will grace any bookshelf and with a cover price of only £8 (less than most paperbacks) is highly recommended. For further information please contact David Evans.